As I am wrapping up my last semester as an undergrad I have been doing a lot of reflection on the last few years of my college attendence. Upon graduating from high school I was at a stand still, but I knew that furthering my education would be the best move for me. While I considered community college in attempts to save money, I ultimately decided that I wanted a true college experience by going to a university, The years have flown by and in less than 3 months I will be receiving my bachelors degree in marketing. I am excited yet I am truly scared of what is in store once graduate, however there is no doubt in my mind that I will not be successful. 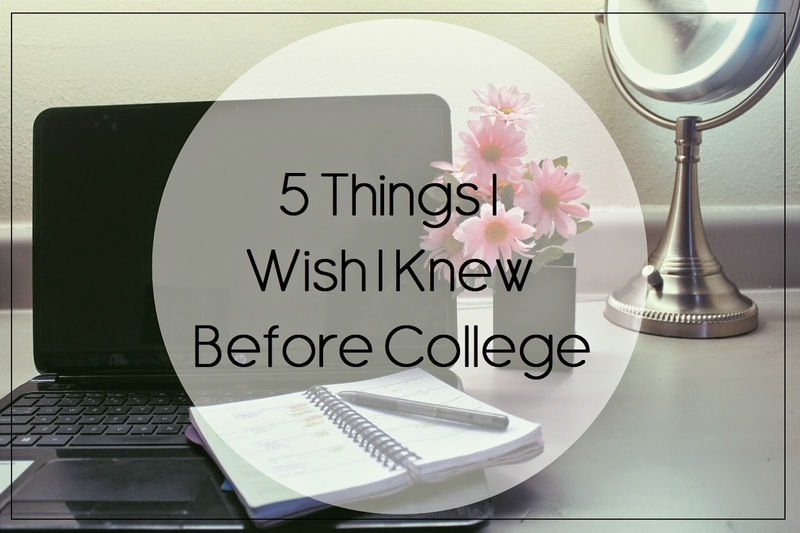 Here are a few things that I wish I could go back and tell myself before attending college. Fresh out of high school it is hard to make decisions about your life in the future. For this reason it is okay for you major to be undecided as you enter college. Over time you will find a subject that will interest you so much that you would want to make a career out of it. When I first entered college I thought that I wanted to be an accountant. Huge mistake. After switching my major a couple of times throughout out my freshman and sophomore years I decided that marketing would be a great major for me. Once I started school I knew that it would be a fresh start for me. Little did I know that college would be nothing like high school. For the most part this was a good thing . Being an introvert back in high school with only a few good friends, it was great to get be in a setting where I wasn't seeing the same people/cliques that I was seeing for the past 4 years. My freshman year of college I got to know a lot of great people. On there other hand college coursework is nothing like the work in high school, Back in the day I excelled in a majority of my classes by doing the bare minimum. In college this will not fly. You must put aside time to study for your courses or you will be pulling all-nighters the day before papers and tests are due in the library (as I was). It was not until recently that I realized how truly helpful counselors and advisors can be. They help put you on the right path while you are making your way through college. Remember these people were once in your shoes: young college students with little guidance. They completely understand how hard it is to be so young and making decisions that will affect your career in the future. Not only are they great for advice, but actually take the time to get to know theses individuals personally. After getting to know you on a personal level they may be able to write you a great reference letter for jobs and internships in the future. The best way to gain experience within your field is to intern. Over the past year I have gained lots of knowledge by interning. I have had opportunity become a social media intern for 4cHairChick Media Group (which was an amazing experience, btw) and most recently started interning for the marketing and communications department at my school. Overall I have gained and developed skills that will help me in the long run. Whether its paid or unpaid, having an internship not only looks good on your resume, but you will gain knowledge and insight that can last a lifetime. I have had the best of luck finding internships online using Indeed and Internships.com, but even your school's career services can help you find the perfect internship for you. 4 years is a long time to spend in school. Why not make the best of it? Trust me it is going to fly by and the next thing you will know you will be walking across that stage with a diploma in your hand. Laugh, network, make friends, fall in love, pick up a new hobby, join a club or organization, and study hard! College is a life changing experience in which you will learn not only academically, but you will also learn about yourself.